Why do self-declared liberals cower in front of Muslim fundamentalists? By Michael WeissMichael Weiss is the editor in chief of the Interpreter, an online journal that translates and analyzes Russian media. Follow him on Twitter: @michaeldweiss. Maritime insecurity incorporates a range of criminal activities, including piracy, smuggling and illegal fishing. The Gulf of Guinea has recently surpassed the more infamous Gulf of Aden as the epicentre of maritime insecurity. It is likely that the United States will increase its naval presence in the Gulf of Guinea during 2014. It is likely that the EU will also participate in an international intervention in the region, though this could possibly be stalled. It is likely that the international community will push West African countries to legislate for the deployment of armed security guards on their vessels and agree to greater inter-state collaboration. The potential conflict of interests between the international community and shipping companies over armed guards and/or external intervention will likely force a consensus approach that will possibly fail to address the root of the problem. It is highly likely that the above moves will lead to a temporary increase in violence in the region. As such, maritime insecurity in the region is likely to increase throughout 2014, and Benin, Togo and Guinea-Bissau, in particular, are likely to witness an increase in criminal activities across their territorial waters. Baku, March 19, IRNA – Based on coordination between Iranian embassy in Azerbaijan and the Azeri government, a number of Iranian nationals imprisoned in Azerbaijani jails will be transferred to Iran soon, said an official with Iranˈs embassy in Baku on Wednesday. Mohsen Molaee told IRNA that he had visited prison number 11 of Azerbaijan Republic today and met with Iranian prisoners.Heavy costs of traveling to Azerbaijan for the prisonersˈ families who want to visit them and also heavy costs of living for the prisoners themselves were their major concerns, Molaee said. As the possibility–however remote–grows that Malaysia Airlines flight 370 may have been hijacked and taken to a hidden location, Israeli authorities are preparing for the possibility that the hijackers might attempt to use the Boeing 777 to mount an attack. According to the Times of Israel, Israel’s Channel 2 has revealed that Israeli air defenses have been boosted, and approaching civilian aircraft will be asked to identify themselves far earlier. In May 2007, INTERPOL Secretary General Ronald K. Noble warned the Senate Committee on the Judiciary’s Subcommittee on Terrorism, Technology and Homeland Security that countries which do not provide their border control officers at airports and other points of entry with direct access to INTERPOL’s database on Stolen and Lost Travel Documents (SLTD) are leaving their citizens exposed to grave danger.Noble told US lawmakers that terrorists’ use of stolen travel documents represents a gaping hole in global security. Frustrated by the deadlock of the second round of Geneva 2 talks, Saudi Arabia has reportedly offered to supply the rebels with anti-aircraft missiles. Meanwhile Russia has accused the US of once again hijacking peace talks and pushing for regime change. 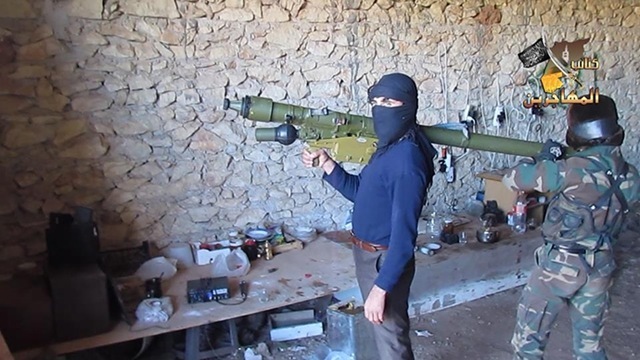 According to a report by the Wall Street Journal, Russian-made antitank guided missiles and Chinese man-portable air-defense systems are up for grabs, already waiting in warehouses in Jordan and Turkey. An Arab diplomat and several opposition figures with knowledge of the Saudi efforts have told WSJ that these supplies are likely to tip the battlefield scales, as the rebels will become capable of taking on the government’s air power and destroying heavy armored vehicles. Will our future Internet be paradise or dystopia? Enter your email address to subscribe to Arcana Intellego and receive notifications of new posts by email.